All responsible breeders of Irish Wolfhounds have their puppies tested for the presence of porto-systemic shunt at around 7 weeks of age. This is recommended by all the UK breed clubs and forms part of their Code of Conduct. 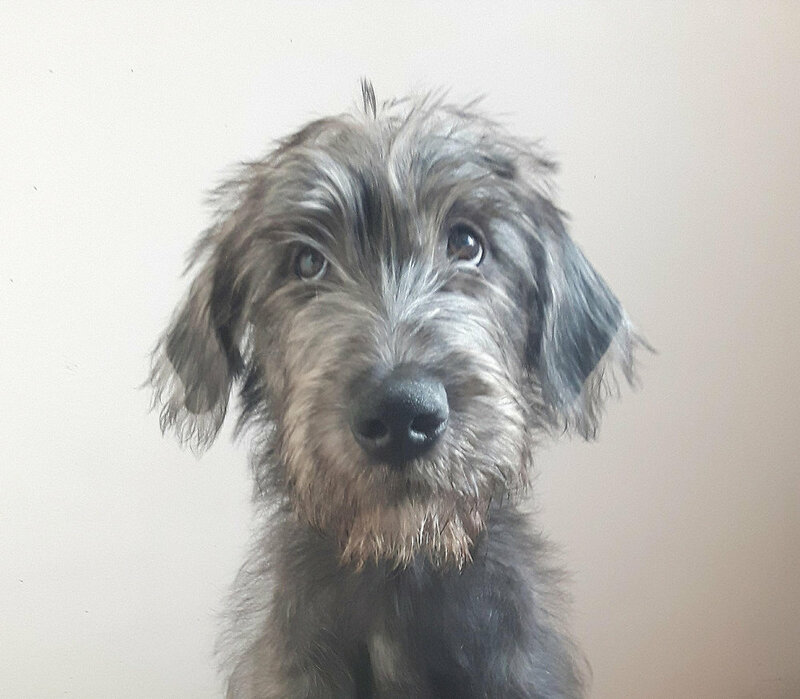 This was the first time that Bjorn's breeder had bred a litter of Wolfhound puppies and she was keen to ensure she did the very best for them. It was a huge shock for her when the results came back and three out of the five puppies had failed the test! This was an especially cruel blow since tragically, seven puppies had been stillborn in this litter. Sadly, Bjorn’s two affected brothers quickly became poorly and had to be put to sleep to prevent further suffering. 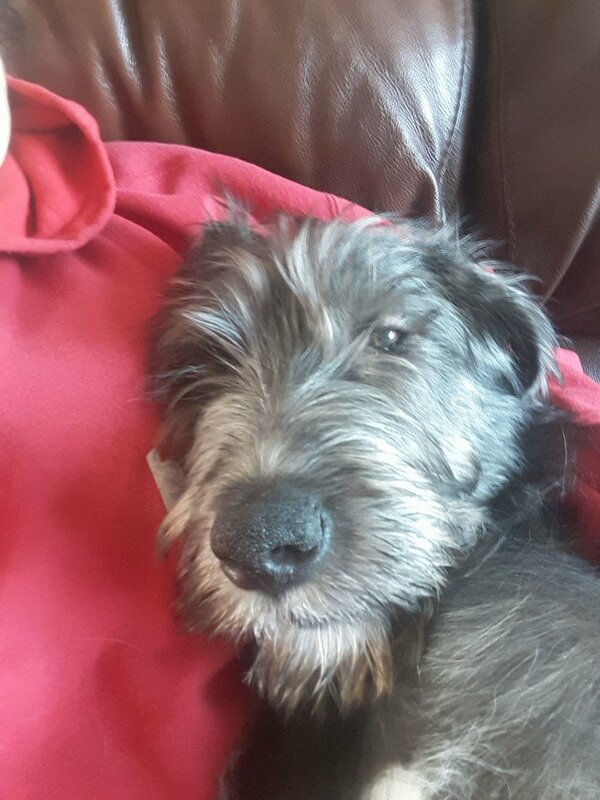 After reading about this tragedy on "The Irish Wolfhound Community" Facebook group, a member of the PAWS Team contacted Bjorn’s breeder to offer advice on feeding him a diet which would help alleviate his symptoms and reduce the toxins in his body. Bjorn's blood results were a little better than his brothers and with the help of the special diet and lots of TLC, he was well enough to undergo a CT scan to assess his chances of having successful surgery. The operation to repair an intrahepatic shunt (that is a shunt which runs inside the liver) requires a highly skilled surgeon and is therefore expensive. This is the same operation that saved the life of Whisper - one of our other PAWS "Inspirations"
This life saving surgery needed to happen as soon as possible, as the longer Bjorn’s liver struggled to cope, the more chance there was for toxins to build up in his system. This could not only jeopardise the success of an operation, it could also prove fatal. His owner/breeder applied for assistance from another Wolfhound charity to help pay for Bjorn’s operation, but it was not forthcoming. With time running out for Bjorn, but with the groundswell of support already shown to his breeder, by the international Community FB group, the PAWS Team discussed the possibilty of launching an appeal. It was unanimously decided that in view of the heartbreaking circumstances and the clear and urgent need for financial assistance in this case, a fundraising campaign specifically for Bjorn’s operation, should be launched immediately. This was the first time that PAWS had attempted to initiate this form of fundraising on such a grand scale. Until that point we had relied mainly on running Fun Days, or selling craft items via our stand at shows, to raise money for equipment to help Wolfhounds in need. We had no way of knowing whether this would be successful or not - but we knew that we had to try to do something to help save this beautiful puppy's life. Donations began pouring in via our website and reached a staggering £2,000 in less than 10hrs! As has been said elsewhere on these pages "People in the wolfhound community do incredible things". As a result of our post on the Community page supporting the fundraiser, we were extremely fortunate to have further support from “Wolfhound Bling!!" This is another international Facebook page, well-known for its remarkable fundraising capabilities via occasional dedicated auctions. Donations and items for auction, were quickly gathered within a couple of hours and bidding was underway immediately. With the Wolfhound Bling!! 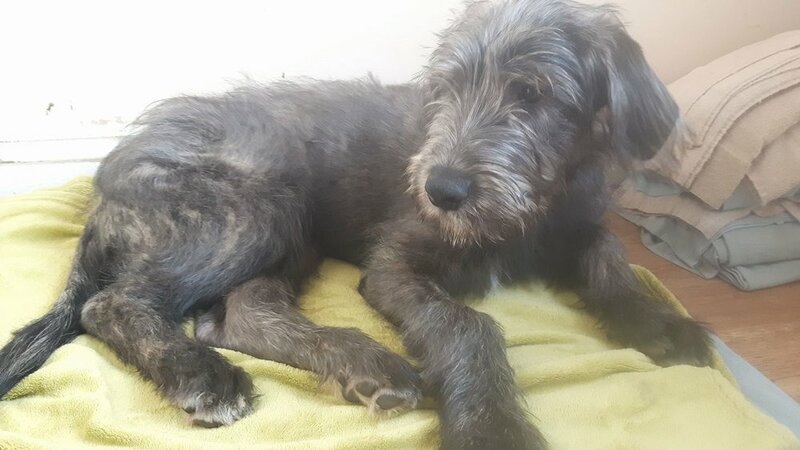 auction flourishing and donations still coming in daily via The Irish Wolfhound Community page, we were delighted to be able to give the go-ahead for Bjorn’s operation to be scheduled. It's a testament to the generosity and camaraderie of Irish Wolfhound lovers worldwide and their depth of feeling for Bjorn, that such a large amount was raised from scratch, in such a short space of time. On 26th January 2018, we are delighted to say that Bjorn underwent surgery at Abbey House Veterinary Hospital in Leeds, for the successful closure of a large, left-sided, intrahepatic shunt. The surgeon was very pleased with how the operation went and Bjorn is now making a good recovery at home. It is still early days, but initial signs are promising. Just 7hrs post op, he’d had a little bit to eat and was wagging his taiI - which he continues to do! His first post op check up was good, his stitches come out next week and then two weeks later, he will have another blood test to check how his liver is doing. Updates on his progress will be posted in our News section. A MASSIVE & HEARTFELT THANK YOU from Bjorn’s family and from the PAWS Team, to EVERYONE who has contributed to make Bjorn's life-saving surgery happen. The money raised in Bjorn’s name, has been paid directly to the veterinary hospital where he was treated. With the full agreement of the Wolfhound Bling group and its supporters, the surplus raised and designated "for Bjorn" has been ring-fenced within our "Welfare Fund". It will be used to benefit another hound in the future who the PAWS Team agree, needs urgent and life-saving assistance. 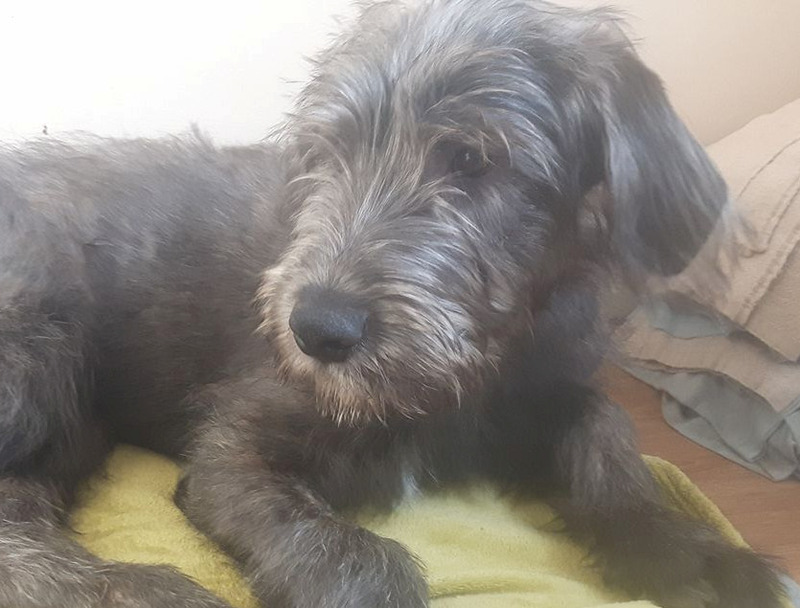 As a result of the PAWS Team highlighting Bjorn's situation on social media, the wonderful world of Wolfhound lovers raised over £7,300 with a dedicated fundraiser to raise money specifically to pay for Bjorn's operation. Bjorn underwent successful surgery for the closure of a large, left-sided, intrahepatic shunt. The surgeon was very pleased with how the operation went and Bjorn is making a good recovery. The PAWS Team paid the money directly to the veterinary hospital and the surplus designated "for Bjorn" has been ring-fenced within our "Welfare Fund" to benefit another hound who may be in of need life-saving assistance in the future.